Pawning a luxury handbag is not a transaction that should be done in a small downtown pawn shop. When a woman needs some fast cash, it is best to have that gorgeous, luxury-brand handbag appraised by a pawn lender that can truly appreciate its value and offer the best money. First, it is best to know what kind of handbag qualifies as “luxury.” Several fashion experts have expressed their opinion on the definition of luxury in terms of fashion items in an article on the Digiday website. So, what are examples of brand-name luxury handbags known to be the most expensive in the world? Here is a list of the top five popular handbags along with their average market values: Chanel – $261,000, Fendi – $28,000, Hermes – $120,000, Louis Vuitton – $42,000, Prada – $1,350. Additionally, a Gucci Dionysius GG Supreme bag at Neiman Marcus costs $780. While a Coach Edie Shoulder bag sells at the Coach website for $295 – no small change for a handbag. The well-heeled woman with a generous income most likely owns at least one of these brands. Quality and Durability – Chanel handbags go through a rigorous battery of durability and quality control tests before they arrive at the store. Durability criteria include the handbag’s ability to withstand any damage from water, heat, or UV rays. Ageless style – A-list Celebrities like Elizabeth Taylor, socialites, and even royals, have been seen carrying Chanel handbags. Investment value – Prices for Chanel handbags go higher every year, so “reselling them is a breeze,” because there will always be women who love their style but are looking for less expensive options. The best resale prices are available for handbags in excellent condition. Practical functionality – Now here is a little history of shoulder straps on Chanel purses in general. Coco Chanel put shoulder chains on the Chanel 2.55 handbag because she enjoyed putting her hands in her pockets. So that is how shoulder bags became so popular – they freed women’s hands! According to an article on the website Purseblog, Hermès handbags have a dynamic appeal of being both scarce and sought-after. This attraction of exclusivity accounts for the very high price tag this brand carries with it. If you’re internet shopping, those prices can range anywhere from a “low” of $4,765 to $185,000 and more. According to that CNBC news report, soccer star David Beckham purchased a Hermès Birkin bag for his wife, Victoria who rose to fame as one of the Spice Girls. That bag cost approximately $100,000. Hermès is a master of color. A-list celebrities pay what everybody else does – no special giveaways for the elite. Hermès handbags will not lose their value if they remain in good condition. No matter how rare and expensive Hermès handbags are, the company can top themselves with an even more exclusive creation. The original Gucci GG canvas diamond pattern was first created in the mid-1960s. Over the years, it has become instantly recognizable as a symbol of luxury and leisure. According to YoogisCloset, the GG pattern is an all-time favorite among Gucci’s customers. However, there are several unique fabric patterns and designs used in Gucci handbags that earn them their place in the brand’s reputation for style and luxury. GG Canvas – These Gucci handbags are crafted from durable woven canvas and joined with leather trim. Vintage Web – This fabric was first developed in the mid-1950s using a combination of red and green. It was an equestrian-inspired design that came from saddle girth, which is the material placed underneath a saddle to prevent it from slipping. Guccissima – The word “Guccissima” means “most Gucci” in Italian. The pattern features the interlocking GG logo and was embossed in 2006. Microguccissima – This is a mini version of the classic Guccissima and can be seen in classic and current handbag styles. Diamante – This pattern was first woven onto hemp, having been originally created during the 1930s as luggage material. Flora – Princess Grace of Monaco personally requested the creation of this silk print, developed in 1966. French-made Louis Vuitton handbags are loved by many women around the world. According to Tanya Mahendra, a fashion writer, there are several good reasons why. In her article, she states that there are a few interesting facts that account for Louis V’s desirability. 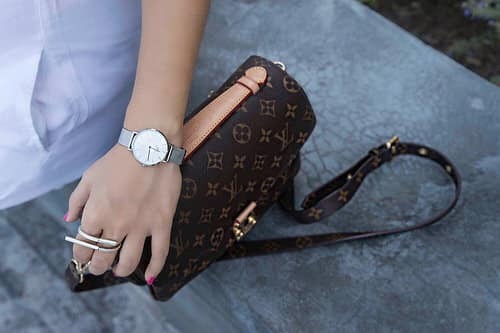 Authentic Louis V. handbags are always handmade, and one week is the average time it takes to make one. Louis V. handbags are not sold at a discount anywhere. However, there are some second-hand sellers that sell “gently used” Louis Vuitton bags. All Louis V. handbags undergo rigorous testing. They are dropped from a height of approximately half a meter, with a 3.5-kilogram weight inside, for several consecutive days. Additionally, the material will not fade, and the zippers are opened and closed about 5,000 times to guarantee sturdiness and dependability in the hands of their owners. Louis V. products that are not sold at the end of a fashion season are returned to the factory in France and destroyed. This preserves an item’s market value and brand class. Why Pawn a Luxury Bag? According to an article by Sophia Kercher in the New York Times, one pawn loan customer was a woman who had just lost her job and needed some quick cash. She went through her closet to find some valuable fashion collateral that could provide her with quick cash. She did this as an alternative to approaching a bank for a loan. Especially because the bank could be an unlikely option for someone who just lost their job. However, she made it clear that she had every intention of reclaiming her handbag. She planned on gathering every penny to pay off her pawn loan and get reunited with her Birkin. One of the other methods of getting hold of fast cash in a pinch, according to Bankrate (an informational website that also directs potential borrowers to lenders), is an unsecured Payday loan. However, that is a very expensive alternative because interest rates on those loans can be as high as 391%. Ouch! When you need some quick cash, and have some valuable luxury fashion items, pawning one of them may be your best, and least expensive, bet. Whatever your reason is for surrendering your very fashionable and luxurious handbag as collateral for a short-term loan, Chapes-JPL is a high-end pawn lender in Atlanta that is ready to offer a loan for your luxury handbag as long as it is in excellent condition. Chapes-JPL offers loans for brand-name handbags such as Chanel, Hermes, and Louis Vuitton, among others. So call Chapes at (404) 504-7021 to get a confidential appointment for a free appraisal of your handbag. When you meet with an appraiser, it is important to have your handbag with you as well as its protective case or box. Additionally, we also require a receipt of purchase, and proper documentation such as valid photo identification. We also require your fingerprints for added protection. Chapes-JPL does not accept heavily worn handbags, even if they are authentic. Our appraisers are experts at identifying brand authenticity. We advise our potential clients not to waste their own time by presenting imitations. Chapes-JPL secures all designers handbags in an offsite vault for safe keeping. Chapes-JPL provides collateral loans on a 30-day period. As long as the interest on the loan is paid every 30 days, it can be extended for as many periods as the client needs before paying off the loan entirely and retrieving their handbag. Additionally, unlike the average pawn shop or payday loan, interest on loans at Chapes are as low as 3%. Typical pawn loans often include high interest rates and fees for handling, security, and tickets. However, Chapes-JPL clients will never pay the high interest rates or security, storage, and other fees.